5/7/2015Share this story on Facebook! Computer Science graduates are well prepared for the challenges of their jobs. Recent graduates are in positions at Lockheed Martin, Microsoft, and IBM, as well as at start-up companies. Other graduates are pursuing further study in distinguished graduate programs in the U.S. and abroad. Marc Howard ’11 wants people all over the world to have access to digital resources. Howard graduated from Ithaca with a bachelor’s in computer science and went on to earn his master’s degree at Columbia University. 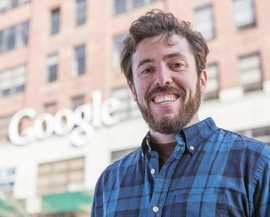 His philosophy that information should be more accessible has taken Howard all the way to Google, where he is a software engineer on the company's idea team. He takes pride in knowing he can write code that has a positive impact on people’s lives. And he enjoys being part of a team of creative, forward-thinking coders.